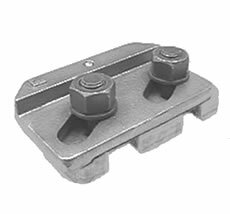 Weldable & Interlocking adjustable crane rail clips: The MX series (also known as the 9000 series) crane rail clips are two part welded adjustable clips. 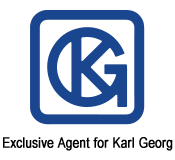 They consist of a clip top and lower weldable forged steel component that interlock, slide and tighten together. The MX series clips are designed and perform as friction connections and therefore must be carefully tightened to the prescribed torque. 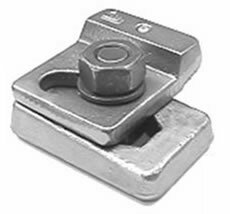 The MX series clip top is supplied with a vulcanized synthetic pressure block. 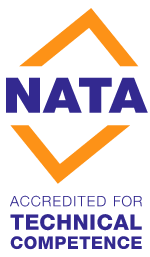 These clips are installed with a standard hex bolt, nut and hardened washer. For convenience the clips are referenced below under both names. For instance the MX24 is also known as the 9119 and when installed with a metric M20 bolt it is a 9120 rail clip. 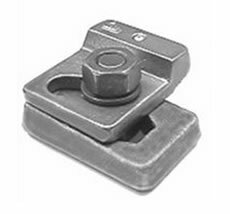 The MX15 rail clip is typically used on smaller rails with lower lateral loading conditions. The MX24 rail clip is generally used in medium sized rail installations. The MX43 two bolt rail clip is designed for the largest lateral loading conditions. 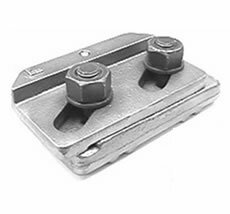 The MX20 rail clip is used on narrow rail support structures. The 9116 rail clip is typically used on smaller rails with lower lateral loading conditions. 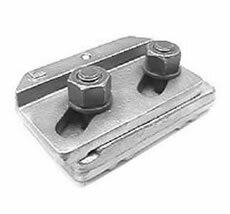 The 9119 rail clip is generally used in medium sized rail installations. The 9219 two bolt rail clip is designed for the largest lateral loading conditions. 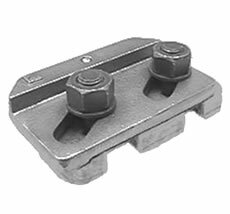 The 9519 rail clip is used on narrow rail support structures.